Not much is known about who crafted this country style cabinet. But it is obvious that they put their own style into designing it, as noted by the pinched cornice on the top. Norm gets into the workshop and crafts his own duplicate of this period piece that was found on the country estate of the Winterthur Museum in Delaware. Condition of this NYW plan: This is a woodworking plan we purchased in a wholesale lot. Excellent condition, new in package. Plan is printed on three sheets of 18 x 24-1/2 inch recycled paper. Standard measurements only (inches). Sorry, the designer does not produce a downloadable version of this plan. Just working on building this now. Plans are excellent. 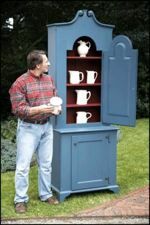 Country Classic Chimney Cupboard Woodworking Plan. In the days before indoor plumbing, washstands were common in American homes. However, they were regarded as strictly as utility furniture, much like a bathroom fixture. This is a vintage project plan.